David Antony Reid Luthier :: The best re-fretting of acoustic, electric, bass and classical Guitars In Glasgow, Edinburgh, Aberdeen, Dundee, Perth, Inverness, Stirling, all of Scotland. The best re-fretting of acoustic, electric, bass and classical Guitars In Glasgow, Edinburgh, Aberdeen, Dundee, Perth, Inverness, Stirling, all of Scotland. David isn't just a guitar tech, he's a multi award-winning guitar maker (luthier), with an international reputation for excelence. So, he knows guitars inside out, and you can be completely asured that when he undertakes all re-fretting work, whether partial or full, on electric, bass, steel strung acoustic, mandolin, banjo, ukulele or classical guitar, you are going to get an unserpassed job done. Does your guitar even need a re-fret? David holds honesty very highly as one of his upmost morals, so it is always best to have your guitar inspected by him, as a re-fret may not even be necessary. Your guitar may merely need a fret dress. Please make an appointment by calling the number on the contact page, or by filling in a contact form, to find out. 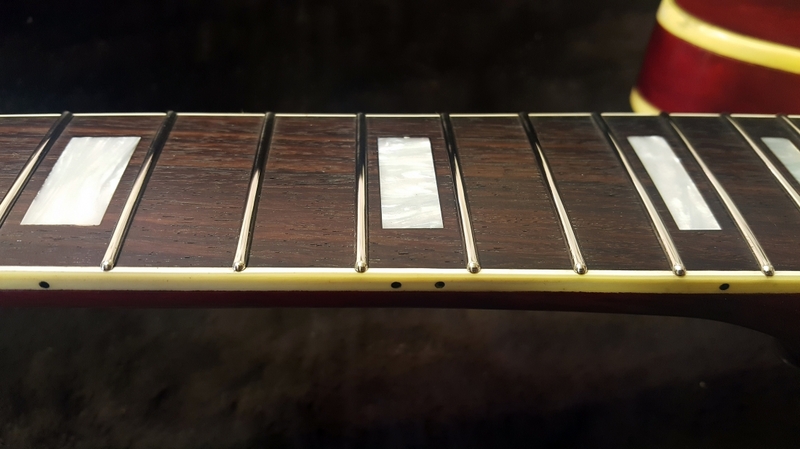 For a full price list of re-frets and fret dresses click "here"
Guitar Neck Re-Set in Scotland, Glasgow, Edinburgh, Aberdeen, Dundee, Perth, Inverness, Stirling. The Best Broken Headstock Repairs In Glasgow, Edinburgh, Aberdeen, Dundee, Perth, Inverness, Stirling, all of Scotland.